Toy Fair 2017 had less Minimate surprises than last year, but what did appear got me excited for the possibilities for the rest of the year. 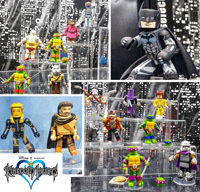 The new reveals were the 80's TMNT cartoon, Netflix Iron Fist, DC Vinimates, and previously hidden characters from the Guardians of the Galaxy Vol 2 and Spider-Man Homecoming movie waves. The Kingdom Hearts license was also announced, but no photos were allowed. Hit the Read More link below to see pics and my thoughts on each of these future releases.